Fort Worth was once home to the most notorious spot in Texas. Hells Half Acre had almost as many saloons, brothels and gambling halls as it had cattle. Almost. Gunslingers and outlaws like Bat Masterson, Doc Holiday, Butch and Sundance were regulars. 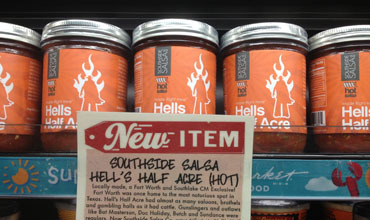 Now Southside Salsa Co pays tribute to Hells Half Acre with a craft salsa™ hot enough to show any taste buds one helluva a good time. Hells Half Acre Hot craft salsa™ is available in special order only. Please email info@southsidesalsaco.com for more ordering details.